I didn't want to travel to paint today so I decided to paint my garden shed. It would have been really great to paint the shed from a different perspective, but there were lots of neighbours outside in their yards and I felt a bit uncomfortable to sit in my yard while painting. So, I sat on the side of my house, but unfortunately, this is the static perspective that caused. Still enjoyed the experience. I was in a hurry to get home after work today, but I am keeping to my word to sketch every day. 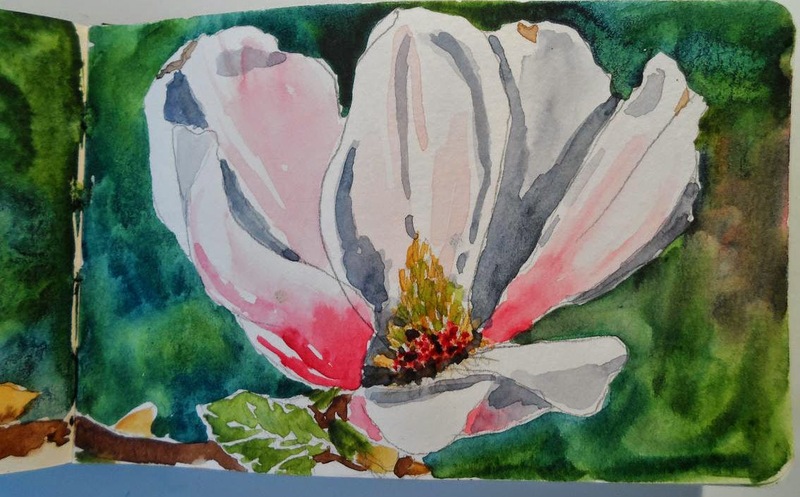 I decided to a quick sketch of a magnolia blossom near Finlay Community Center. It only took about 30 min and I really enjoyed the challenge of trying to draw the blossom. I do find it easier to draw organic shapes than geometric. 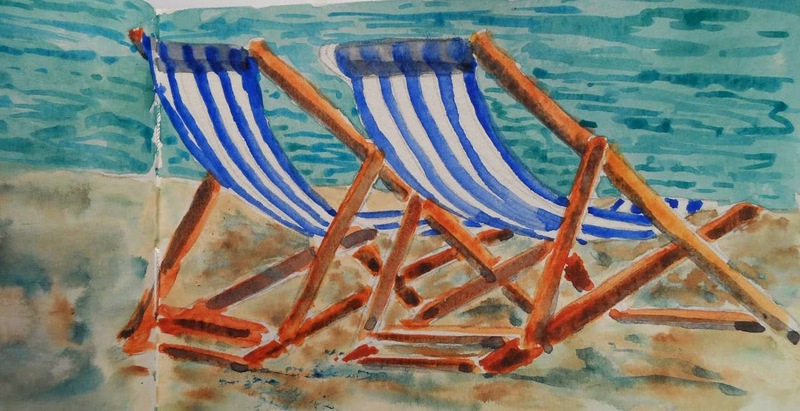 I had this old photo of some deck chairs for quite some time and had been wanting to paint them. I don't suppose they are the most comfortable chair, but they sure are a neat looking chair~! I had been wanting to paint today, but it was quite cold out. 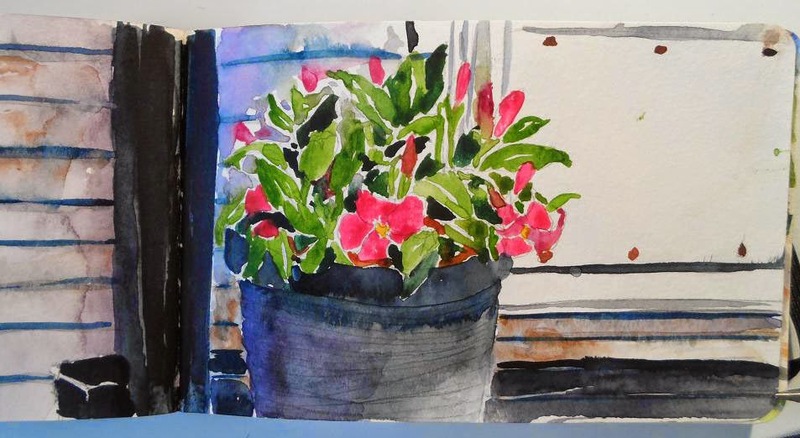 I bought a potted plant at the garden center the other day for our front doorstep, so I decided to sit on the steps and try to paint it. This way, if it was truly too cold, I could pop inside after the initial drawing and finish the painting. 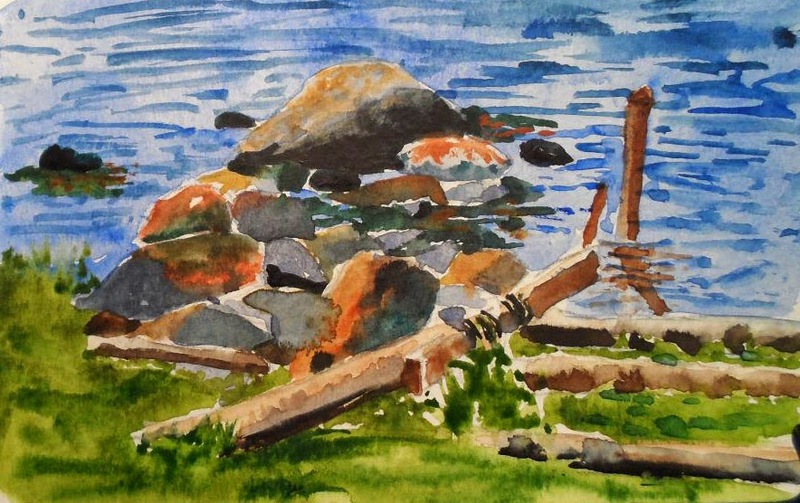 Just a quick sketch of some rocks near a boat launch just outside Chester. I love sketching in the 3.5 x 5.5 Moleskine. I was so resistant to painting in the Moleskines because I found the paper to be of very poor quality. It is very lightweight and has very little tooth. However, they were on sale at Deserres and I bought one just to try it. I was very surprised just how much I like them. The paper acts like hot press paper in that you can really manipulate the paint on the surface before it dries. Now, I am hooked. I still reserve Arches 140 for planned paintings, but for everyday sketching, I really enjoy the Moleskines. It took me a month to fill my first 30 page journal...a painting a day~! I started my new journal today. I am trying the larger format 8.25 x 5 this time. As you can see, I am not very good yet at planning the size of my sketch on the page. Hence, the cut off top of the house. However, I find pleasure in the fact that I am getting out daily and sketching on site. A quick sketch of a garden bench. I am a self-taught artist who discovered the world of watercolour purely by accident in 1995. My favorite subjects are flowers, boats and glass. My greatest passion is to create unique and original visual enjoyment and many of my pieces are incorporated in private collections throughout Canada. I have been a contributing artist with the ASRS at the Art Gallery of Nova Scotia since 1998. I continually find inspiration in the mediums themselves by exploring with different techniques and textures. Watercolour gives me the freedom to explore hidden perceptions and express them by blending closely observed reality with colour, texture, patterns and light. I do not subscribe to the idea that an artist has only one true voice or style of painting. Thank you for your interest ~~!